購買LOVE LIVE! SUNSHINE!! 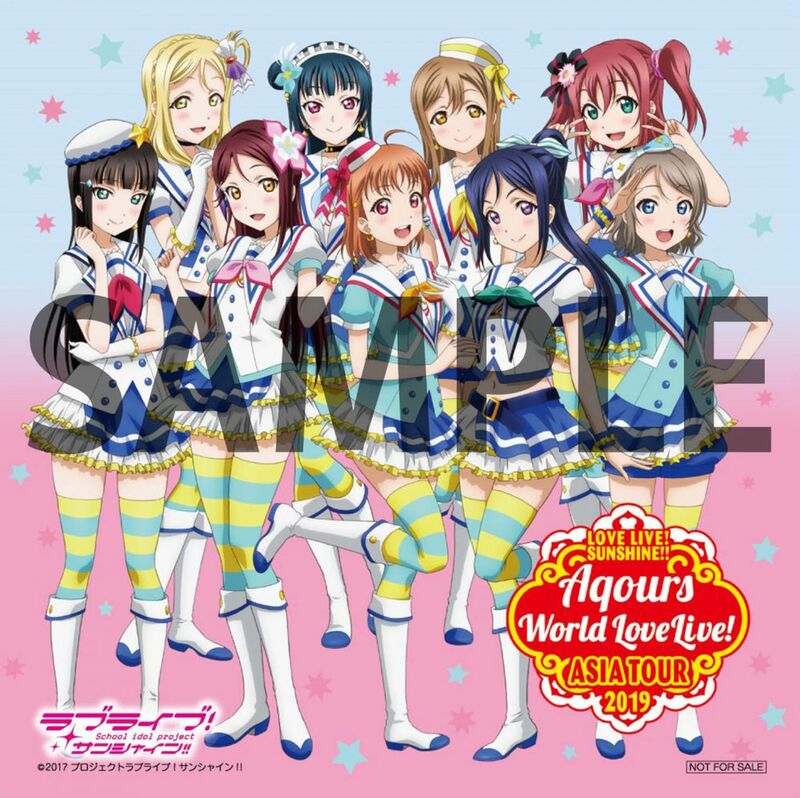 Aqours World LoveLive! ASIA TOUR 2019 CD/Blu-ray/DVD可獲得的特典已正式確定! LOVE LIVE! SUNSHINE!! Aqours World LoveLive! ASIA TOUR 2019 CD/Blu-ray/DVD 특전결정! Love Live! 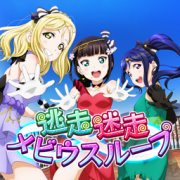 School Idol Festival reaches its 5th anniversary on Sunday, May 12, 2019. Join in this pre-celebration campaign which begins on Monday, April 22 UTC! Join in to earn rewards and more as we prepare to celebrate this milestone! Earn 5th Anniversary Round 1 Lottery Tickets for a chance to win great prizes, including 5th Anniv. UR Scouting Tickets! Please see the in-game notification for further details. Log in from Monday, April 22 UTC to get a 5th Anniv. Round 1 Lottery Ticket, and special collaboration members! This special Step-Up Scouting features one limited series every day focused on Honor Student Scouting series which have been released over the last year. All SR and above members will ONLY be of the specified series and the first two steps require fewer Love Gems than usual. Don't miss this incredible chance to try and get your favorite members! Step 2: Scout 11 for 40 Love Gems with two SR or above members guaranteed. Step 3: Scout 11 for 50 Love Gems with an SSR or above guaranteed. Step 4: Scout 11 for 50 Love Gems with only SR or above members guaranteed. Step 5: Scout 11 for 50 Love Gems with an SR or above guaranteed. - Please see the "Details" for more information on which members appear. - Step-Up Scouting is eligible for Honor Student Bonus. - Please see the in-game notification for further details. This special scouting opportunity features supporting member scouting for μ's and Aqours. Use Gs to scout and power up your team even more! Extra Gs can be obtained through the limited-time Goals! - See the "Details" section for more info on which members appear. - You will not receive Honor Student Bonus by using this ticket. Please see the Goals screen during each available period for further details. ・Clear three Live Shows to complete each challenge. ・Rewards include a 5th Anniv. Round 1 Lottery Ticket, Stickers, and Gs. ・Log in for the JOYSOUND collaboration story, "It's Great to Sing Together"! 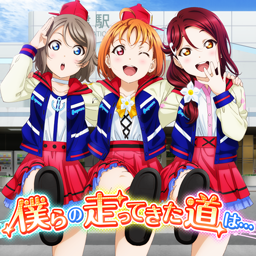 Don't miss out on these limited-time songs from the Love Live! Sunshine!! movie. Get a selection of member exchange tickets while they are available! - You may exchange Stickers for up to two of each ticket. Just post to Twitter through the in-game campaign banner during the period below in order to receive one Love Gem as a present! 1. Tap on the "5th Anniv. Pre-Celebration Twitter Campaign" banner seen on the Home screen. 2. Log in to and post to Twitter through the window that opens. 3. Once completed, a pop-up will notify you of gift receipt. The gift will be sent to your Present Box. ■ School Idol Fan Packs Renewed! The School Idol Fan Packs will be renewed as the "School Idol Support Pack" in commemoration of the global version's 5th anniversary! The date it will be available will also change, so don't miss it! - This pack can be purchased once per player during the available period. - It can only be purchased via payment methods accepted by respective application stores. Love Gems cannot be used. This 5th Anniversary Pre-Celebration Campaign is only a preview of what’s to come for the upcoming 5th anniversary celebrations. Be sure to look out for further updates about this and future campaigns! Thank you again for playing Love Live! 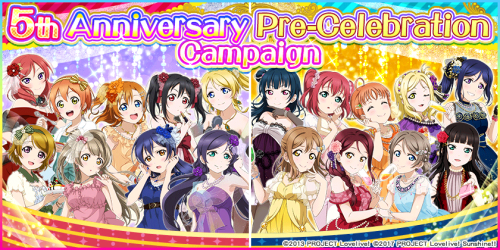 School Idol Festival, and we hope that you enjoy this campaign! At the venue of LOVE LIVE! SUNSHINE!! Aqours World LoveLive! ASIA TOUR 2019、customers who purchased the target product will receive a special gift on a first-come-first-served basis! Please get it to commemorate the live! ※Please note that CD/Blu-ray/DVD will not sale at Shanghai performances. Present one of special gift for each purchase more than 2,000 yen BANDAI NAMCO Arts’s music products and video products. ※Details of Taiwan and Korea performances will be announced later. 凡在演唱會會場購買LOVE LIVE! SUNSHINE!! 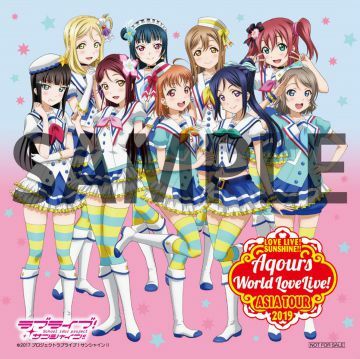 Aqours World LoveLive! ASIA TOUR 2019相關商品可獲得精美禮物一份,先到先得! CD/Blu-ray/DVD를 구입하신 관객분들에게 선착순으로 특전상품을 증정합니다! 라이브 기념 특전이오니 꼭 체크해주세요! ※상하이 공연에서는 CD/Blu-ray/DVD를 판매하지 않습니다. 사전에 양해부탁드립니다. BANDAI NAMCO Arts에서 발매된 CD/Blu-ray/DVD를 2000엔이상 구입하면 스티커 1장 선물! ※상해공연에서는 CD/Blu-ray/DVD를 판매하지 않습니다. 사전에 양해부탁드립니다. ※특전은 1회 구매 시 1장이 제공됩니다. ※상품 및 특전은 수량이 한정되어 있으므로, 조기에 소진될 경우 증정이벤트를 종료합니다. 양해바랍니다.